We are extremely proud to have as our first guest blogger Melanie Shakarian, Director of Development & Communications for The Legal Aid Society of Cleveland. CRP is a strong supporter of the mission of Legal Aid and its efforts of fostering fairness and eliminating barriers to justice in Northeast Ohio and all across the country. 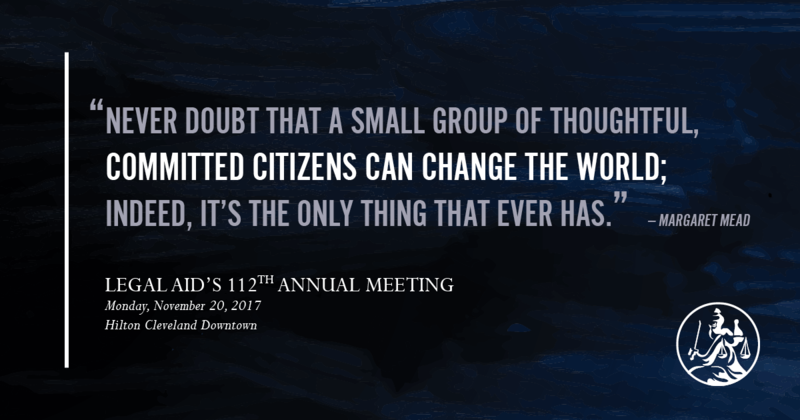 We’re honored to have Cleveland Reporting Partners as a sponsor of Legal Aid’s 112th Annual Meeting and Report to the Community on November 20, 2017 at the Hilton Cleveland Downtown. This luncheon celebrates and recognizes the diverse organizations and individuals who have played a role in advancing our mission throughout Northeast Ohio. Since 1905, The Legal Aid Society of Cleveland has helped families living in poverty stop their civil legal issues from escalating. Legal Aid provides critically needed counsel at the moment civil legal matters threaten health, shelter, safety, education or economic security. Our 40+ full-time attorneys and more than 500 volunteer lawyers use their deep knowledge of civil justice to provide such support to families. Last year, Legal Aid helped resolve civil legal problems for nearly 18,000 people. There is an overwhelming need for civil legal services in Cuyahoga and surrounding counties, but because of limited resources, we are forced to turn away one of every two eligible clients that come to us. Our volunteer lawyers are a crucial component in the work we do, and we love getting the word out to the legal community about our diverse pro bono opportunities. You can be a part of Legal Aid’s critical work to reach members of our community where and when they need civil legal counsel. You can also learn more about Legal Aid at our annual meeting. There’s still time to purchase tickets. You can also follow us on Facebook and Twitter to get event updates, hear client success stories and connect with volunteer opportunities. ABOUT THE AUTHOR: Melanie Shakarian is Director of Development & Communications for The Legal Aid Society of Cleveland. She can be reached at melanie.shakarian@lasclev.org or (216) 861-5217. Receive an email update when we post about legal technology, court reporting, legal video and other tips for attorneys, paralegals and legal secretaries. Copyright © Cleveland Reporting Partners, LLC, Court Reporters in Cleveland, Ohio, All Rights Reserved.